From streetside stalls dishing out one dollar bowls of braised pork rice to upscale eateries tucked away in quiet alleyways, Michelin inspectors are scouring the Taiwanese capital selecting restaurants for its first ever guide. The island’s reputation among in-the-know travelers as a foodie paradise will be further burnished when Taipei becomes the latest Asian city to have its own Michelin guide in the first quarter of 2018. Traditionally seen as a posh gourmet compass, budget eats are increasingly recognised by Michelin and have used the prestigious award to build big businesses. Hong Kong’s Tim Ho Wan went from hole-in-the-wall to successful chain while a Singapore hawker awarded a Michelin star last year has grown his soy sauce chicken stall into a franchise. Taiwanese foodies are speculating that Jinfeng-a no-frills corner joint serving Tw$30 ($1) bowls of rice topped with braised minced fatty pork, called “lu rou fan”-could make the cut. But shop manager Wu Su-yan says she is indifferent and the long queues of tourists and locals speak for themselves. “Having customers is confirmation enough. We don’t need it to be written on a piece of paper to know our lu rou fan is good,” she said. Shin Yeh’s five branches in Taipei are packed most nights of the week and the 40-year-old institution hopes Michelin will spotlight the types of traditional dishes it serves, which have fallen out of favour with some young Taiwanese. Favorites such as pan-fried pork liver cost Tw$280 while dark orange slices of roasted mullet roe go for Tw$680 a portion, putting its prices well above street snacks but far below the highest end restaurants. A thick golden omelette studded with preserved turnip is so popular that Shin Yeh’s kitchens have spots reserved just for making the dish, says brand director Cybie Fang, with new chefs taking three months to master the recipe. Fang believes the new guide might help rebrand Taiwanese cuisine for young domestic consumers, some of whom see Shin Yeh’s menu as “too passé”. “No matter how many restaurants get stars, I think it is a big plus for Taiwan,” she says. But others worry about the burden winning the stars could bring. “I will be quite ecstatic for a moment, but there will be enormous pressure for me,” says Tony Wang whose restaurant Niu Ba Ba, or “Beef Father” serves up bowls of Taiwanese staple beef noodles for an eye watering Tw$10,000. It also offers cheaper noodles starting from Tw$500, but still manages to sell three of the expensive bowls daily on average. Wang insists the price reflects the quality of the ingredients-he says he spent Tw$60 million and years researching different kinds of beef. His recipe uses four types of premium meat, broth made from four kinds of tomatoes, and noodles that cost six times the average because they are kneaded from Japanese flour. The Michelin guides, first published in France more than a century ago to promote automobile travel, made their first foray into Asia with a Tokyo edition in 2007. 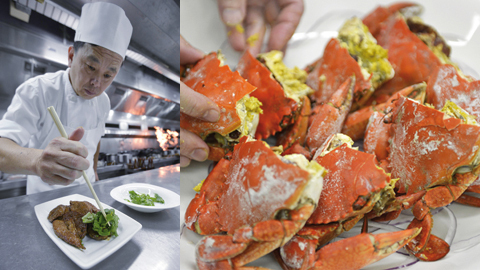 Taiwan’s most famous chef André Chiang was awarded two Michelin stars for his Singapore restaurant André. However, he recently announced he would close it in February and return the accolade to focus on his high-end Taipei restaurant RAW, which serves up intricate artistic versions of Taiwanese classics and has a months’ long waiting list for a table.